Competitive economies – they’re the ones with no employment laws, right? Do you know of any statistical evidence to substantiate the claims that the existing unfair dismissal rules are preventing UK employers from creating new jobs? So far, nobody has come back with any, probably because there isn’t any. There appears to be little or no association between employment protection legislation strictness and overall unemployment. He also quotes some research which suggests that, beyond a certain point, low levels of employment protection could damage economic growth. From the point of view of per capita growth of GDP…employment protection in the early 1990s was too low in countries like Australia, Canada, Denmark, Ireland, Switzerland, the UK and the US. As luck would have it, two international comparisons of competitiveness have been published in the last couple of months. 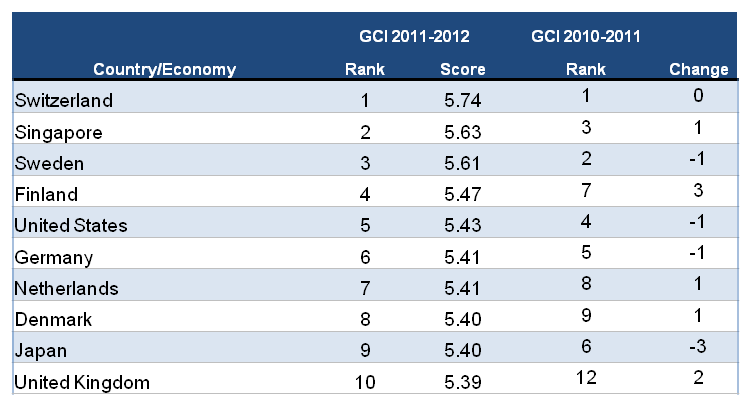 Some of the government websites still say that the UK is 4th in the World Bank’s Ease of Doing Business index. The sharp-eyed will note that, in the latest rankings published at the end of October, Britain has slipped to 7th place. That’s three places dropped on David Cameron’s watch. Now to be fair to the government, this is not because of anything it has or hasn’t done. The index is an international comparison of 183 countries and the difference between the countries at the top is very narrow. We have slipped in certain areas like getting electricity and registering property, probably because other countries have improved slightly. None of this has much to do with employment regulations. Norway and Denmark, both of which have more employment protection than the UK, have overtaken us this year. It’s also interesting to note that Britain is still number one when it comes to getting credit for business, in spite of all those nasty banks refusing to lend. Apart from the US and Singapore, all of them have a lot more employment protection than the UK does. By continental standards, the UK operates a highly liberal labour market with the minimum of legislative intervention and administrative ‘red tape’. In this highly unionised country, terms and conditions are laid down within both a framework of progressive employment laws and a rolling two-yearly incomes policy agreement. All new laws are subject to extensive consultations with the social partners and collective agreements become generally effective in their sectors if deemed appropriate by a tripartite committee. Imagine the outcry if we had something like that. Employment contracts are subject to the Swiss law of obligation. About half the working population are subject to standard contracts drawn up by either the canton governments or a professional body. It is also normal for contracts to refer to the organisation’s standard statement of employment conditions. Probationary periods may operate for up to three months, after which dismissal is normally only lawful for either gross misconduct or serious economic reasons. A long-standing limitation exists on Sunday working, for which a special permit is required from the canton authorities. If Luke Johnson foams at the mouth about the UK’s meagre employment protection, imagine what he’d do if he was faced with something like this. Almost watertight protection after three months and government permits required for Sunday working? He’d be apoplectic! Yet none of these restrictions seem to stop these countries being economically competitive. Have a look at the legal frameworks of other European countries in the top ten. Do you think managers have an easier job in any of these places? If they do, it’s not because their employment law is less complex. There have been a number of polemics railing against employment protection over the last week or so but they all feature the politics of I Met A Man. Employment Law is killing business because I know someone who is pissed off with it. All this proves is that a lot of business people get frustrated by regulation, which we knew anyway. No-one has shown just how and by how much employment protection acts as a drag on the economy. Nor has anyone adequately explained why countries with a lot more employment protection manage to be more competitive and have higher growth rates than the UK. Government imposed contracts, legally backed collective agreements, civil codes and tripartite structures would all be loathed by most of our business leaders and politicians, yet they don’t stop other economies from growing and being competitive. We haven’t got any of this stuff so what’s our excuse? 10 Responses to Competitive economies – they’re the ones with no employment laws, right? outstanding blogging as ever – the more comprehensively this myth about employment law gets busted the better. Did you ever hear the hit single? the counter argument to making it easy for employers to fire people, is why would someone invest a lot of their time acquiring skills for an industry where they can be fired on the spot for no reason? Well done Rick your getting there…..